Definition at line 26 of file Inquirer.h. Definition at line 79 of file Inquirer.h. Definition at line 24 of file Inquirer.cc. References asyncCall(), closer, comm_add_close_handler(), conn, debugs, Snmp::Request::fd, Comm::Connection::fd, Ipc::fdnInSnmpSocket, RefCount< C >::getRaw(), HERE(), Ipc::ImportFdIntoComm(), noteCommClosed(), and Ipc::Inquirer::request. Definition at line 73 of file Inquirer.cc. References Snmp::Pdu::aggregate(), aggrPdu, error(), snmp_pdu::errstat, Snmp::Response::pdu, and SNMP_ERR_NOERROR. Definition at line 128 of file Inquirer.cc. References AsyncJob::callException(), DBG_CRITICAL, debugs, Ipc::Inquirer::handleException(), and HERE(). Definition at line 44 of file Inquirer.cc. References Comm::Connection::close(), closer, comm_remove_close_handler(), conn, Comm::Connection::fd, Comm::IsConnOpen(), and NULL. Definition at line 96 of file Inquirer.cc. Definition at line 66 of file Inquirer.cc. References aggrPdu, snmp_pdu::errstat, Ipc::Inquirer::handleException(), and SNMP_ERR_GENERR. Definition at line 156 of file Inquirer.cc. References UnaryMemFunT< Job, Data, Argument1 >::arg1, Ipc::Response::clone(), Ipc::Inquirer::DequeueRequest(), AsyncCall::getDialer(), Must, NULL, Ipc::Response::requestId, and ScheduleCallHere. Referenced by Ipc::Coordinator::handleCacheMgrResponse(), and Ipc::Coordinator::handleSnmpResponse(). Definition at line 62 of file Inquirer.cc. References asyncCall(), callback, debugs, AsyncJob::done(), eventAdd(), Ipc::Inquirer::handleRemoteAck(), HERE(), Ipc::Inquirer::LastRequestId, Ipc::Port::MakeAddr(), Must, NULL, Ipc::Inquirer::pos, Ipc::Inquirer::request, Ipc::Inquirer::RequestTimedOut(), Ipc::SendMessage(), Ipc::Inquirer::status(), Ipc::strandAddrLabel, Ipc::Inquirer::strands, Ipc::Inquirer::TheRequestsMap, and Ipc::Inquirer::timeout. Referenced by Ipc::Inquirer::handleRemoteAck(), Mgr::Inquirer::noteWroteHeader(), Ipc::Inquirer::requestTimedOut(), and start(). 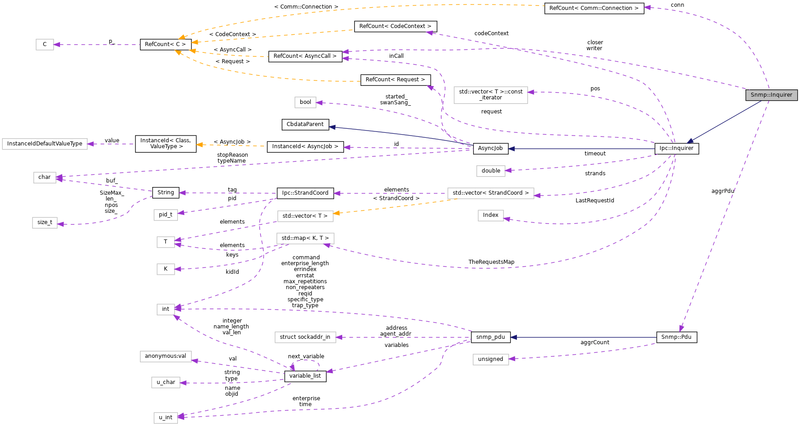 Referenced by HttpStateData::abortAll(), Ftp::Client::abortAll(), Comm::TcpAcceptor::acceptOne(), Adaptation::Ecap::XactionRep::adaptationAborted(), Adaptation::AccessCheck::callBack(), AsyncJob::callException(), Security::PeerConnector::connectionClosed(), HttpStateData::continueAfterParsingHeader(), Ftp::Client::ctrlClosed(), Adaptation::Iterator::handleAdaptationBlock(), Adaptation::Iterator::handleAdaptationError(), Log::TcpLogger::handleClosure(), Adaptation::Icap::Xaction::handleCommClosed(), Http::Tunneler::handleConnectionClosure(), Mgr::Forwarder::handleError(), Ipc::Forwarder::handleError(), Ipc::Forwarder::handleException(), Ipc::Inquirer::handleException(), HttpStateData::handleMoreRequestBodyAvailable(), Ipc::Inquirer::handleRemoteAck(), Ipc::Forwarder::handleTimeout(), HttpStateData::httpStateConnClosed(), HttpStateData::httpTimeout(), Comm::ConnOpener::noteAbort(), Adaptation::Icap::ModXact::noteBodyConsumerAborted(), Snmp::Forwarder::noteCommClosed(), noteCommClosed(), Mgr::Inquirer::noteCommClosed(), Mgr::Forwarder::noteCommClosed(), Mgr::StoreToCommWriter::noteCommClosed(), Adaptation::Icap::Xaction::noteCommRead(), Rock::HeaderUpdater::noteDoneReading(), Adaptation::Iterator::noteInitiatorAborted(), Adaptation::Icap::Xaction::noteInitiatorAborted(), Adaptation::Ecap::XactionRep::noteInitiatorAborted(), HttpStateData::readReply(), Comm::ConnOpener::sendAnswer(), Rock::Rebuild::start(), Security::PeerConnector::start(), HttpStateData::start(), Ipc::UdsSender::timedout(), and HttpStateData::wroteLast(). Definition at line 87 of file Inquirer.cc. References conn, CommCommonCbParams::conn, debugs, Comm::Connection::fd, HERE(), Comm::IsConnOpen(), Must, AsyncJob::mustStop(), and NULL. Definition at line 102 of file Inquirer.cc. References Snmp::Request::address, aggrPdu, comm_udp_sendto(), snmp_pdu::command, conn, debugs, Comm::Connection::fd, Snmp::Pdu::fixAggregate(), HERE(), len, Snmp::Request::session, snmp_build(), SNMP_PDU_RESPONSE, and SNMP_REQUEST_SIZE. Definition at line 57 of file Inquirer.cc. References conn, debugs, HERE(), Ipc::Inquirer::inquire(), Comm::IsConnOpen(), Must, and Ipc::Inquirer::start(). Definition at line 202 of file Inquirer.cc. References Packable::appendf(), buf, MemBuf::content(), Ipc::Inquirer::request, MemBuf::reset(), and MemBuf::terminate(). Referenced by Ipc::Inquirer::handleRemoteAck(), and Ipc::Inquirer::inquire(). References Ipc::Inquirer::cleanup(), debugs, Ipc::Inquirer::DequeueRequest(), HERE(), Ipc::Inquirer::removeTimeoutEvent(), Ipc::Inquirer::request, and Ipc::Inquirer::sendResponse(). Definition at line 48 of file Inquirer.h. Referenced by aggregate(), handleException(), and sendResponse(). Definition at line 52 of file Inquirer.h. Referenced by cleanup(), and Inquirer(). Definition at line 49 of file Inquirer.h. Referenced by cleanup(), Inquirer(), noteCommClosed(), sendResponse(), and start(). Definition at line 82 of file Inquirer.h. Definition at line 74 of file Inquirer.h. Referenced by Ipc::Inquirer::doneAll(), Ipc::Inquirer::handleRemoteAck(), Ipc::Inquirer::inquire(), and Ipc::Inquirer::requestTimedOut(). Definition at line 71 of file Inquirer.h. Referenced by Ipc::Inquirer::DequeueRequest(), Ipc::Inquirer::handleRemoteAck(), Ipc::Inquirer::inquire(), Inquirer(), Ipc::Inquirer::requestTimedOut(), Ipc::Inquirer::start(), Ipc::Inquirer::status(), and Ipc::Inquirer::swanSong(). Definition at line 73 of file Inquirer.h. Referenced by Ipc::Inquirer::doneAll(), Ipc::Inquirer::inquire(), Ipc::Inquirer::Inquirer(), Mgr::Inquirer::sendResponse(), and Mgr::Inquirer::start(). Definition at line 80 of file Inquirer.h. Referenced by Ipc::Inquirer::DequeueRequest(), and Ipc::Inquirer::inquire(). Definition at line 76 of file Inquirer.h. Definition at line 51 of file Inquirer.h.